Fong Lum Kwai was born in August of 1898, in the village of Ho Chung in the Lung Doo area of Southern China. He was the second son of a wealthy lichee farmer. <?xml:namespace prefix = o ns = "urn:schemas-microsoft-com:office:office" /> Fong Lum Kwai�s foundation in kung fu came from his training in China. He began his training at the age of 4 under the tutelage of his father. His basic training with his father was intense, they lived in a time when money was the law and anyone could be killed in a fight over nothing. 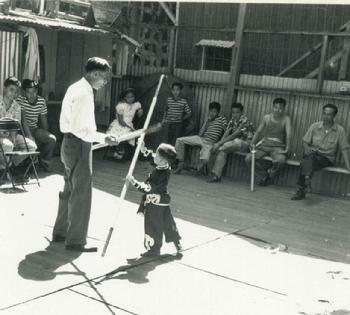 Villagers would fight over boundaries and water rights, which made kung fu a difference in who was right or wrong. At the age of 5 or 6 Fong Lum Kwai's father was framed and poisoned in prison. Fong Lum Kwai�s next teacher was Lum Kwok Biu. Lum Kwok Biu was from the north, but his teacher was, Fong Hu Hui, who was from Fong Lum Kwai's village. Fong Hu Hui's teacher was said to be the Monk Choy Fook also known as Lan Toe Hall. Choy Fook was one of the few surviving monks to escape the burning Shaolin Temple. The martial art that Choy Fook taught was known as Fut Gar or Buddhist Arts because Choy Fook was a Buddhist Monk. It was said that Choy Fook taught Fong Hu Hui when he was still up in northern China. This makes Fong Lum Kwai a 3rd generation Fut Gar student under the Choy Fook lineage. In 1922, because of uncertain times in China, Fong Lum Kwai's mother bought papers to have her son immigrate to the United States. Fong Lum Kwai first landed in San Francisco. After 6 months of living with his cousins, he decided to move to the warmer climates of Hawaii. Landing early in the morning, Fong Lum Kwai got off the ship and began to wander around Honolulu Hawaii's Chinatown. With no where to go, he sat down in front of the Chi Sun Chinese Dry Goods, owned by Young Duck Yo. Young Duck Yo saw the young immigrant Fong Lum Kwai sitting there. After talking to Fong Lum Kwai he gave him a job and a place to live in the storeroom above the store. Fong Lum Kwai worked for and had his 3 daily meals with Young Duck Yo's family. This is generosity unheard of today, helping a total stranger and treating him like family. Fong Lum Kwai always said that Young Duck Yo was kindest man he ever knew. When Fong Lum Kwai came to Hawaii in 1923, it was said that there was a group of friends who trained in their individual styles of gung fu down at the horse stables on River Street in Chinatown. Every night 15 to 20 men would meet up after dinner at the horse stable. There they would train from 6pm till 12 midnight. <?xml:namespace prefix = o ns = "urn:schemas-microsoft-com:office:office" /> Sometime during the early 1930's some businessmen decided to organize a formal gung fu school. With a lot of enthusiasm, Fong Lum Kwai would go down after work to help with the renovation of an old laundry building that was being converted into the new gung fu school. In 1933, Hawaii's Jing Mo was opened for classes. It was there some of the men went from working out at the stables to the new Jing Mo School. The training area in Jing Mo was an wooden floor deck, it was an open air area about 20 feet wide and 20 feet long. The main building was used to store the weapons, lion dance equipment and to hold social events (mah jong). Fong Lum Kwai was appointed to teach basic stances to all new members. It was also during this time that Sifu Fong met Master Kwan Bung Hen in a Honolulu Chinatown Chinese herb store. Master Kwan practiced a style deep in the internal arts. His forms were all palms that began and ended without clenching a fist. Sifu Fong and Master Kwan were good friends and traded techniques. Master Kwan Bung Hen also taught briefly at Jing Mo. 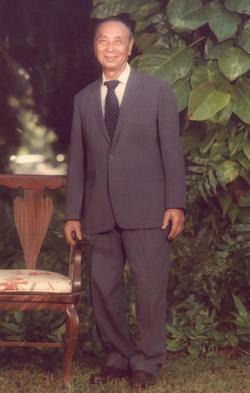 Fong Lum Kwai brought with him to Hawaii a solid foundation of Fut Gar from the Choy Fook lineage that he learned in China. This did not stop him from wanting to continue learning and improving his skills.<?xml:namespace prefix = o ns = "urn:schemas-microsoft-com:office:office" /> It was 1925 or 1926 that Fong Lum Kwai met Lum Dai Yung. Since the Cantonse dialect they both spoke was very similar, and being only 4 years apart in age, they became good friends. Their relationship was more like friends then student and teacher. Fong Lum Kwai respected Lum Dai Yung as his Sifu and became his eldest and senior student in Hawaii. Lum Dai Yung taught a version of Fut Gar from Shaolin. From 1933 to 1939, Sifu Fong was a charter and active member of Jing Mo. In 1939, a decision was made to move on with Master Lum Dai Yung and establish Gee Yung. From 1939 to 1955, Sifu Fong was one of Master Lum Dai Yung's top ten disciples. In 1957 when Lam Dai Yung passed away, several of these disciples would go on to found Lung Kong Physical Culture Club in 1958. Among the founders and charter instructors would include Sifu Lau Kim, Sifu Andrew Lum, and Henry Lau. At the time of its founding, Lung Kong had two appointed masters by title, Master Jeurng Manh Uck and Master Lau Il Cho. They were given the titles because they were the elders. Teaching at Lung Kong at that time was Sifu Andrew Lum, Sifu Lau Kim, Henry Tom, and Mike Young, Master Jeurng and Master Lau would hold their classes on separate days from them. In 1959, after seeing that Sifu Fong was there to help teach at Lung Kong, Sifu Andrew Lum, Sifu Lau Kim, and Mike Young would make their exit and help establish the Kuomintang Physical Culture Association. Eventually in 1960, Sifu Fong's superior skills were recognized, and he chosen to become the lone Sifu of the Lung Kong Physical Culture Club. 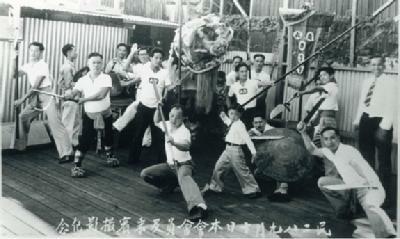 Sifu Fong Lum Kwai would go on to teach and be an anchor for Lung Kong until 1995. In 1988, with the blessing of Sifu Fong, the Chinese Lion Dance Association was founded by a number of his students with the name given by him. It was also announced to the membership of Lung Kong that Sifu Fong Lum Kwai would give permission to two students to continue teaching his version of Fut Gar. 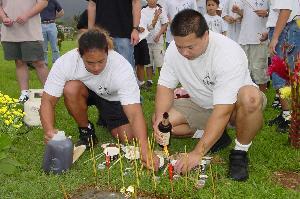 The two students were Sifu Jeffrey Lam and Tambert Lau. Today in Hawaii, there are more than ten gung fu/lion dance schools, but the Chinese Lion Dance Association is one of the few that is certified by a Grandmaster. Sifu Fong Lum Kwai's gung fu training would help him live to a ripe old age of 95. It was on his own accord that he would pass away. On the morning of his death, he told his grandnephew that he was tired and that he was leaving. That night he passed away in his sleep. The doctors were baffled and could not understand why he passed as his pulse and blood pressure had been normal that night, and there was no sign of fever or organ failure. is classified by the IRS as a 501(c)(3) non-profit organization.